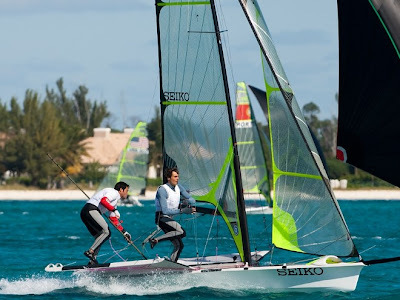 Cool temperatures did not dampen the competitive sailing in Freeport, Grand Bahama with Iker Martinez and Xabier Fernandez of Spain jumping into the lead of the 49ers. Although the mercury was low, the winds were up averaging 16-18 knots on the race course. The Spaniards reveled in the conditions posting 3-2-3 finishes with the Italian Sibello brothers stepping up to finish second in the qualifying with a 4-1-4. The British teams had a tough day with Stevie Morrision and Ben Rhodes slipping to third in the series after being caught under a black flag while John Pink and Rick Peacock received a DSQ in an altercation with Nathan Outteridge and Iain Jensen. 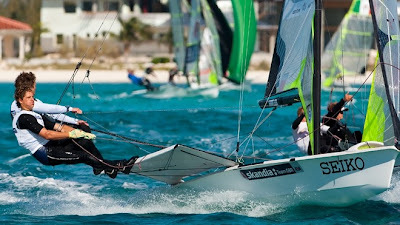 Conditions of shifty winds at the weather mark caused a few upsets in the days racing, mixing up the results. With the fleet now entering the finals on Thursday, the heat is on both on the water and in the expected increase in the air temperature. 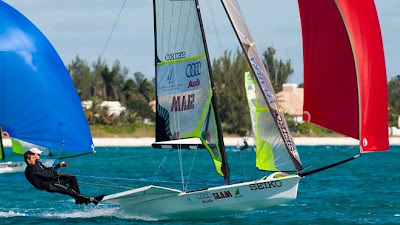 Results at http://www.sail-world.com/go_link.cfm?srcid=15&nid=65199&link=http://www.49erworlds.org as well as the Facebook: 49er World Championship page and Twitter. Int49er. Channel 49er, the latest video link for the 49er Class has video and interviews.